Our mission is to enhance the success of our members by promoting the highest standards of ethics, education and professional excellence. Ethics & Advocacy – Leading the investment industry forward with courage by taking an active role to advocate for higher ethical standards. Professional Growth – Helping our members stay current in a continuously evolving profession by offering educational programs. Career Development – Offering tools and resources to gain an edge and stand out at every step of their careers. 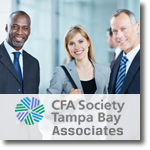 CFA Society Tampa Bay accepts a limited number of associates each year. If you are not a CFA Charterholder and are interested learning about the benefits of becoming an Associate, click here.